SO GOOD ... HE'S AMBIDEXTROUS! Comedy juggler Dale Jones has been called the most unique juggler in the world with good reason. Jones invented an entirely new way to juggle in order to compensate for his right hand (which he injured severely at age eight). Featured in both "PEOPLE MAGAZINE" and "USA TODAY," the International Juggler's Association has touted Jones as one of the world's best jugglers despite his disability. Jones performs world-class original comedy along with his juggling. In fact his act is so entertaining that after guest starring on the "STATLER BROS. SHOW," (TNN), the producer said, "Dale Jones completely blew us away." On concert dates, Jones has shared the stage with Ray Stevens (Anderson Music Hall, Hiawassee, GA); KC & The Sunshine Band (Chip In's Island Resort & Casino, Harris, MI); and Marie Osmond (Rickman Auditorium, Arnold, MO), to name a few. Jones has even headlined a one-man show three different times in Branson, MO (Owen's Theater). 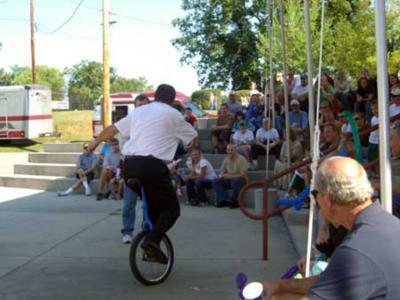 He is also one of very few jugglers to ever have star status in a Ringling Bros. and Barnum & Bailey television special ("CLOWN COLLEGE," CBS). Jones "travels in that rare air. He's certainly one of a kind," according to "THE ASSOCIATED PRESS" article on him. "He fills the act with wit," said "CHICAGO SUN-TIMES" Comedy Reporter, Ernest Tucker. To be sure, his act is a highly original, skill packed, belly-laughter, with a huge, rousing finish! Which allows Jones to state with confidence that "my goal is always to be the most well received entertainer anywhere I perform." Please note Dale Jones, One-Handed Comedy Juggler will also travel to Manchester, Chesterfield, Glencoe, Grover, Saint Louis, Valley Park, Fenton, Eureka, Allenton, High Ridge, Saint Albans, Saint Charles, Cottleville, Maryland Heights, Pacific, Earth City, House Springs, Bridgeton, Saint Ann, Saint Peters, Catawissa, Defiance, Arnold, Gray Summit, Cedar Hill, Augusta, O Fallon, Hazelwood, Imperial, Labadie.